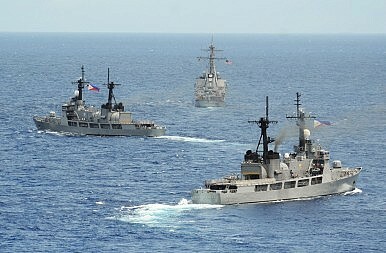 Japan and the Philippines held their first joint naval exercises in the South China Sea on Tuesday. According to media reports, following a port call, two Japanese destroyers and a Philippine warship participated in a maritime safety exercise to the west of Manila in the South China Sea. It involved some 600 Japanese personnel on the two navy destroyers – JS Harusame and Amigiri – engaging in a “passing exercise” with some 100 Philippine navy complement of the Filipino warship BRP Ramon Alcaraz as well as a Philippine helicopter landing on one of the Japanese ships. The exercise is part of a broader effort by Japan and the Philippines to boost their defense relationship amid growing anxiety about Beijing’s actions in the maritime domain and Japan’s increased engagement with Southeast Asia under Prime Minister Shinzo Abe. As I have noted previously, Tokyo and Manila have been building on the security side of a strategic partnership first inked in 2011 in recent months, including signing a memorandum of understanding in January when Philippine Defense Secretary Voltaire Gazmin paid a three-day visit to Tokyo (a visit which I covered here). Japan is also supplying patrol boats and coastguard vessels to the Philippines, as I reported on here. The two countries also held anti-piracy drills earlier this month, while Tokyo is also mulling joint patrols in the South China Sea with Washington. Philippine officials were careful to emphasize that the exercise was not related to disputes Manila has with China and that the interaction was occurring clearly within its own waters. Vice Admiral Jesus Millan clarified that the joint exercise was related to the Code for Unplanned Encounters at Sea (CUES), a protocol developed by western Pacific navies, including China, for the safety of vessels meeting at sea. Naval spokesman Commander Lued Lincuna also mentioned that the drill site, which was reportedly within inland waters 10 nautical miles west of Corregidor Island at the tip of Manila Bay, was far from the Scarborough Shoal, which China seized from the Philippines in 2012. Nonetheless, China’s Foreign Ministry Spokesman Hua Chunying said that Beijing remained concerned about the drills. “We have noticed the relevant report and will pay close attention to this. It is hoped that relevant countries…would refrain from playing up tensions or doing anything detrimental to security [and] mutual trust among regional countries and peace and stability in the region,” she said. Japan Wins New Philippine Defense Deal Philippines to Hold Military Exercises with US, JapanJapan to Give Philippines Two Large Patrol VesselsJapan Submarine, Destroyers Visit Philippines What’s Next for Japan-Philippines Defense Ties?